Wow. What a metamorphosis and an unexpected good surprise! 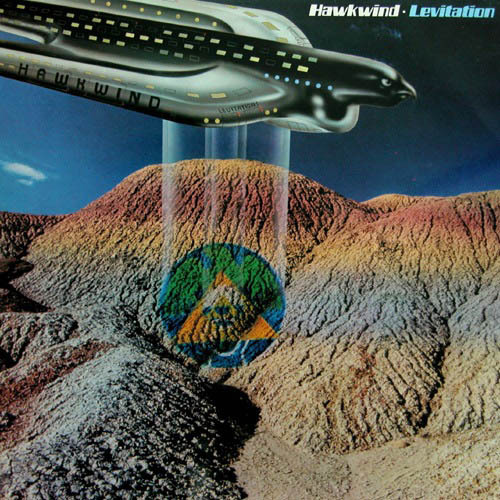 With "Levitation", HAWKWIND really embraces the new spirit of the 80's. Dave Brock used the best of what this controversial decade has to offer to refresh the band's musical style: heavy metal, catchy synthesizers, urgency and energy. No more stoner psychedelic rock or lengthy improvisations, the tracks are now shorter, more direct and more concise. There will be no turning back. However, this 1980 opus really provides varying ambiances, as it alternates aggressive, peaceful, rock and electronic passages. In fact, nearly half of the disc is instrumental! But, most important, the inspiration and novelty are present. The production has also improved and the sound quality is great. New decade, new line-up. Robert Calvert gone, Dave Brock is the only original member remaining and thus goes back to lead singing. Ginger Baker and especially ex-GONG and solo keyboardist Tim Blake join the band. "Levitation" also marks the surprising return of guitarist Huw Lloyd-Langton, his last apparition dates from the self- titled 1970 debut! Ex-"HAWKWLORDS" Harvey Bainbridge is recruited at bass. The title track is simply a space metal hymn. Catchy, bombastic, with various guitar and keyboards, it really rocks! A classic from the Hawks! The aerial "Motorway City" is a softer pleasant rock piece, showing that the band has truly embraced the eighties. "Psychosis" is a strange short experimental passage composed by Harvey Bainbridge. It serves as an introduction for the thundering "World Of Tiers". A surprising instrumental composition, as it alternates powerful space metal and calmer moments. "Prelude" is another peaceful electronic ambient transition for "Who's Gonna Win The War". Average melody, not many variations, this lazy song is the only weak track of the record. On the contrary, the instrumental "Space Chase" is another mighty ferocious space metal gem. Mindblowing! "The Fifth Second Of Forever" opens with a delicate acoustic guitar introduction, and then unveils a cool space rock ballad, in the style of "Hall Of The Mountain Grill". "Dust Of Time" adopts a rhythm and bass line similar to PINK FLOYD's "Another Brick in the Wall Part 2", but for a futuristic musical purpose. Coupled with a robotic ambiance and a punchy melody, the final result is quite unique, even in the band's discography. Love it! "Levitation" is full of classics and truly provides a journey to cosmos through various musical galaxies. One more time, Dave Brock proves his band is still on par with its time while maintaining and adapting its identity. After the audacious but unequal late 70's experimentations of the Calvert-era/punk-years, this 1980 opus genuinely represents HAWKWIND's rebirth. The spaceship is fully ready to venture into the eighties, which have been fatal for so many progressive bands. With Captain Brock leading, the passengers are completely reassured. "Levitation" marks the beginning of the Hawks' second life in the eighties, which can be considered as their silver or heavy metal years. One the best HAWKWIND albums, and the best from the 80's! A space metal classic.